Baghdad had for centuries been the capital of the Abbasid Caliphate, the third caliphate whose rulers were descendants of Abbas, an uncle of Muhammad. In 751, the Abbasids overthrew the Umayyads and moved the Caliph's seat from Damascus to Baghdad. At the city's peak, it was populated by approximately one million people and was defended by an army of 60,000 soldiers. By the middle of the 13th century, however, the power of the Abbasids had declined and Turkic and Mamluk warlords often held power over the Caliphs. Baghdad still retained much symbolic significance, however, and it remained a rich and cultured city. The Caliphs of the 12th and 13th centuries had begun to develop links with the expanding Mongol Empire in the east. Caliph an-Nasir li-dini'llah, who reigned from 1180–1225, may have attempted an alliance with Genghis Khan when Muhammad II of Khwarezm threatened to attack the Abbasids. It has been rumored that some Crusader captives were sent as tribute to the Mongol khagan. According to The Secret History of the Mongols, Genghis and his successor, Ögedei Khan, ordered their general Chormaqan to attack Baghdad. In 1236, Chormaqan led a division of the Mongol army to Irbil, which remained under Abbasid rule. Further raids on Irbil and other regions of the caliphate became nearly annual occurrences. Some raids were alleged to have reached Baghdad itself, but these Mongol incursions were not always successful, with Abbasid forces defeating the invaders in 1238 and 1245. Despite their successes, the Abbasids hoped to come to terms with the Mongols and by 1241 had adopted the practice of sending an annual tribute to the court of the khagan. Envoys from the Caliph were present at the coronation of Güyük Khan as khagan in 1246 and that of Möngke Khan in 1251. During his brief reign, Güyük insisted that the Caliph Al-Musta'sim fully submit to Mongol rule and come personally to Karakorum. Blame for the Caliph's refusal and for other resistance offered by the Abbasids to increased attempts by the Mongols to extend their power was placed by the khagans on Chormaqan's lieutenant and successor, Baiju. In 1257, Möngke resolved to establish firm authority over Mesopotamia, Syria, and Persia. The khagan gave his brother, Hulagu, authority over a subordinate khanate and army, the Ilkhanate, and instructions to compel the submission of various Muslim states, including the caliphate. Though not seeking the overthrow of Al-Musta'sim, Möngke ordered Hulagu to destroy Baghdad if the Caliph refused his demands of personal submission to Hulagu and the payment of tribute in the form of a military detachment, which would reinforce Hulagu's army during its campaigns against Persian Ismaili states. In preparation for his invasion, Hulagu raised a large expeditionary force, conscripting one out of every ten military-age males in the entirety of the Mongol Empire, assembling what may have been the most numerous Mongol army to have existed and, by one estimate, 150,000 strong. Generals of the army included the Oirat administrator Arghun Agha, Baiju, Buqa Temür, Guo Kan, and Kitbuqa, as well as Hulagu's brother Sunitai and various other warlords. The force was also supplemented by Christian forces, including the King of Armenia and his army, a Frankish contingent from the Principality of Antioch, and a Georgian force, seeking revenge on the Muslim Abbasids for the sacking of their capital, Tiflis, decades earlier by the Khwarazm-Shahs. About 1,000 Chinese artillery experts accompanied the army, as did Persian and Turkic auxiliaries, according to Ata-Malik Juvayni, a contemporary Persian observer. Hulagu led his army first to Persia, where he successfully campaigned against the Lurs, the Bukhara, and the remnants of the Khwarezm-Shah dynasty. After subduing them, Hulagu directed his attention toward the Ismaili Assassins and their Grand Master, Imam 'Ala al-Din Muhammad, who had attempted the murder of both Möngke and Hulagu's friend and subordinate, Kitbuqa. Though Assassins failed in both attempts, Hulagu marched his army to their stronghold of Alamut, which he captured. 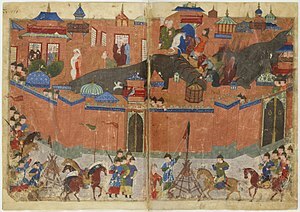 The Mongols later executed the Assassins' Grand Master, Imam Rukn al-Dun Khurshah, who had briefly succeeded 'Ala al-Din Muhammad from 1255-1256. After defeating the Assassins, Hulagu sent word to Al-Musta'sim, demanding his acquiescence to the terms imposed by Möngke. Al-Musta'sim refused, in large part due to the influence of his advisor and grand vizier, Ibn al-Alkami. Historians have ascribed various motives to al-Alkami's opposition to submission, including treachery and incompetence, and it appears that he lied to the Caliph about the severity of the invasion, assuring Al-Musta'sim that, if the capital of the caliphate was endangered by a Mongol army, the Islamic world would rush to its aid. Although he replied to Hulagu's demands in a manner that the Mongol commander found menacing and offensive enough to break off further negotiation, Al-Musta'sim neglected to summon armies to reinforce the troops at his disposal in Baghdad. Nor did he strengthen the city's walls. By January 11 the Mongols were close to the city, establishing themselves on both banks of the Tigris River so as to form a pincer around the city. Al-Musta'sim finally decided to do battle with them and sent out a force of 20,000 cavalry to attack the Mongols. The cavalry were decisively defeated by the Mongols, whose sappers breached dikes along the Tigris River and flooded the ground behind the Abbasid forces, trapping them. The Abbasid caliphate could supposedly call upon 50,000 soldiers for the defense of their capital, including the 20,000 cavalry under al-Musta'sim. However, these troops were assembled hastily, making them poorly equipped and disciplined. Although the caliph technically had the authority to summon soldiers from other Muslim empires to defend his realm, he either neglected to do so or lacked the ability to. His taunting opposition had lost him the loyalty of the Mamluks, and the Syrian emirs, who he supported, were busy preparing their own defenses. On January 29, the Mongol army began its siege of Baghdad, constructing a palisade and a ditch around the city. Employing siege engines and catapults, the Mongols attempted to breach the city's walls, and, by February 5, had seized a significant portion of the defenses. Realizing that his forces had little chance of retaking the walls, Al-Musta'sim attempted to open negotiations with Hulagu, who rebuffed the Caliph. Around 3,000 of Baghdad's notables also tried to negotiate with Hulagu but were murdered. Five days later, on February 10, the city surrendered, but the Mongols did not enter the city until the 13th, beginning a week of massacre and destruction. Many historical accounts detailed the cruelties of the Mongol conquerors. Baghdad was a depopulated, ruined city for several centuries and only gradually recovered some of its former glory. The Mongols looted and then destroyed mosques, palaces, libraries, and hospitals. Priceless books from Baghdad's thirty-six public libraries were torn apart, the looters using their leather covers as sandals. Grand buildings that had been the work of generations were burned to the ground. The House of Wisdom (the Grand Library of Baghdad), containing countless precious historical documents and books on subjects ranging from medicine to astronomy, was destroyed. Survivors said that the waters of the Tigris ran black with ink from the enormous quantities of books flung into the river and red from the blood of the scientists and philosophers killed. Citizens attempted to flee, but were intercepted by Mongol soldiers who killed in abundance, sparing neither women nor children. Martin Sicker writes that close to 90,000 people may have died. Other estimates go much higher. Wassaf claims the loss of life was several hundred thousand. Ian Frazier of The New Yorker says estimates of the death toll have ranged from 200,000 to a million. The caliph Al-Musta'sim was captured and forced to watch as his citizens were murdered and his treasury plundered. According to most accounts, the caliph was killed by trampling. The Mongols rolled the caliph up in a rug, and rode their horses over him, as they believed that the earth would be offended if it were touched by royal blood.All but one of Al-Musta'sim's sons were killed, and the sole surviving son was sent to Mongolia, where Mongolian historians report he married and fathered children, but played no role in Islam thereafter (see The end of the Abbasid dynasty). The historian David Morgan has quoted Wassaf describing the destruction: "They swept through the city like hungry falcons attacking a flight of doves, or like raging wolves attacking sheep, with loose reins and shameless faces, murdering and spreading terror...beds and cushions made of gold and encrusted with jewels were cut to pieces with knives and torn to shreds. Those hiding behind the veils of the great Harem were dragged...through the streets and alleys, each of them becoming a plaything...as the population died at the hands of the invaders." Some[who?] historians believe that the Mongol invasion destroyed much of the irrigation infrastructure that had sustained Mesopotamia for many millennia. Canals were cut as a military tactic and never repaired. So many people died or fled that neither the labour nor the organization were sufficient to maintain the canal system. It broke down or silted up. This theory was advanced by historian Svatopluk Souček in his 2000 book, A History of Inner Asia. Other historians point to soil salination as the primary cause for the decline in agriculture. Hulagu left 3,000 Mongol soldiers behind to rebuild Baghdad. Ata-Malik Juvayni was later appointed governor of Baghdad, Lower Mesopotamia, and Khuzistan after Guo Kan went back to Yuan Dynasty to assist Kublai conquest over the Song Dynasty. The Mongol Hulagu's Nestorian Christian wife, Dokuz Khatun successfully interceded to spare the lives of Baghdad's Christian inhabitants. Hulagu offered the royal palace to the Nestorian Catholicos Mar Makikha, and ordered a cathedral to be built for him. Initially, the fall of Baghdad came as a shock to the whole Muslim world, but the city became an economic center where international trade, the minting of coins and religious affairs flourished under the Ilkhans. The chief Mongol darughachi was thereafter stationed in the city. ^ a b c L. Venegoni (2003). Hülägü's Campaign in the West - (1256-1260) Archived 2012-03-12 at WebCite, Transoxiana Webfestschrift Series I, Webfestschrift Marshak 2003. ^ The different aspects of Islamic culture: Science and technology in Islam, Vol.4, Ed. A. Y. Al-Hassan, (Dergham sarl, 2001), 655. ^ Matthew E. Falagas, Effie A. Zarkadoulia, George Samonis (2006). "Arab science in the golden age (750–1258 C.E.) and today", The FASEB Journal 20, pp. 1581–1586. ^ Spuler, op. cit., from Ibn al-'Athir, vol. 12, p. 272. ^ "Mongol Plans for Expansion and Sack of Baghdad". alhassanain.com. Archived from the original on 2012-04-26. ^ "Wednesday University Lecture 3". depts.washington.edu. Retrieved 1 May 2018. ^ "European & Asian History". telusplanet.net. ^ Rashiddudin, Histoire des Mongols de la Perse, E. Quatrieme ed. and trans. (Paris, 1836), p. 352. ^ L. Carrington Goodrich (2002). A Short History of the Chinese People (illustrated ed.). Courier Dover Publications. p. 173. ISBN 0-486-42488-X. Retrieved 2011-11-28. In the campaigns waged in western Asia (1253-1258) by Jenghis' grandson Hulagu, "a thousand engineers from China had to get themselves ready to serve the catapults, and to be able to cast inflammable substances." One of Hulagu's principal generals in his successful attack against the caliphate of Baghdad was Chinese. ^ Zaydān, Jirjī (1907). History of Islamic Civilization, Vol. 4. Hertford: Stephen Austin and Sons, Ltd. p. 292. Retrieved 16 September 2012. ^ a b c d Davis, Paul K. (2001). Besieged: 100 Great Sieges from Jericho to Sarajevo. New York: Oxford University Press. p. 67. ^ James Chambers, "The Devil's Horsemen," p. 144. ^ Fattah, Hala. A Brief History of Iraq. Checkmark Books. p. 101. ^ Murray, S.A.P. (2012). The library: An illustrated history. New York: Skyhorse Publishing, pp. 54. ^ Frazier, Ian (25 April 2005). "Annals of history: Invaders: Destroying Baghdad". The New Yorker. p. 4. Archived from the original on 2017-10-10. Retrieved 2012-01-01. ^ Marozzi, Justin (29 May 2014). Baghdad: City of Peace, City of Blood. Penguin Books. pp. 176–177. ISBN 978-0-14-194804-1. ^ "Saudi Aramco World : The Greening of the Arab East: The Planters". saudiaramcoworld.com. Archived from the original on 2006-01-25. Retrieved 2006-02-03. ^ Coke, Richard (1927). Baghdad, the City of Peace. London: T. Butterworth. p. 169. ^ Kolbas, Judith G. (2006). The Mongols in Iran: Chingiz Khan to Uljaytu, 1220–1309. London: Routledge. p. 156. ISBN 0-7007-0667-4.